Miam! 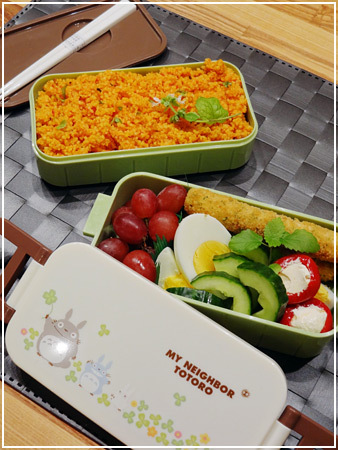 So lovely bento. It’s very fresh! Nice to see you bentoing again. Have you ever tried quinoa. It can be cooked in the rice cooker like rice (1.5 to double amount water) – so effort is manageable. It tastes really good and through its high protein values ​​and unique amino acid structure it is really valuable for vegetarians. I have tried quinoa, but I’m not too fond of it to be honest. I have eaten okay quinoa in restaurants, but no matter how well I wash it at home it will always turn out bitter and slimy for some reason. Hm – I wonder about quinoa being slimy and bitter. I never made this experience. I do not wash very well (just whisk it in some water one time). Somehow it sounds like a quality issue. Maybe there are different kinds of product treatment? Couscous is also my favorite in busy times but since I have the rice cooker, I do not care for time issues as it cooks rice, quinoa and a lot of other stuff by itself. To “cook” bulgur same way like couscous is news for me – I always heard/read that you have to simmer for 7 – 8 min and to let soak-up some more minutes. Will try your way. 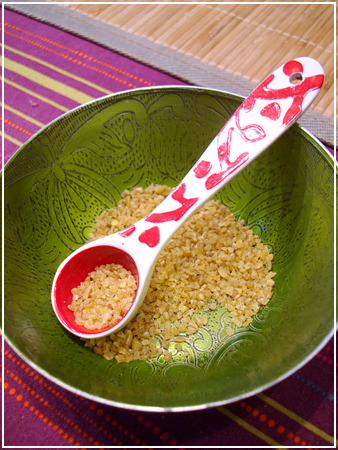 It might depend on the grain size of the bulgur. I usually take rather fine grain – about the same size as couscous – and it cooks just fine. I don’t think I had problems with bigger sizes either but on the other hand it usually soaks overnight in the box in any case, which should take care of any excess dryness or moisture.